I spent last night with the session of a local Presbyterian church that has shrunk to 40 active participants. After 30 years of pain, they’ve finally decided to come to grips with a member who keeps hurting people enough to make them leave. People have left for other reasons as well, but even long-time older members are now leaving because they’re tired of being intimidated. Two weeks ago, I sat with the council of another local Presbyterian congregation, also down to 40 active participants, as they considered whether they can afford even a part-time pastor. In fact, six of the eight Presbyterian congregations in this city are small enough to be within sight of closing. But I’m done being sad for them or anxious about them, and I think they should be done, too. Instead, I think it’s time for all of us to play! I started thinking about play as I read an interview with Michael Moody and Sharna Goldseker, co-authors of Generation Impact: How Next Gen Donors Are Revolutionizing Giving, a book about the impact millennials will have on philanthropy. The authors are interested in “succession” in multi-generational philanthropic families—how each successive generation is brought into the giving philosophy of the family. As soon as I read Moody’s description, I thought of congregations. So many long-time members have talked to me about how tired they are of their committee work. They’re desperately waiting for the next generation to step up, but younger generations don’t want to “step up” anymore. They’re not interested in receiving the baton and running the next leg of the same old race. They’d rather all be in a scrum together, bringing their own energy and ideas to the game. And since the scrum and the baton belong to two very different games played by very different people, congregants don’t always appreciate each other’s style of play. Everybody ends up walking away, which, come to think of it, is a whole different schoolyard game—taking my ball and going home! Generational differences aside, however, maybe the problem isn’t that we’re trying to play two different games. Maybe it’s that we’re not truly playing at all. Most congregations, and especially the smaller ones where I spend most of my time, worry about their future. And as any worrier will tell you, anxiety, even the kind that affects institutions rather than individuals, produces observable symptoms—feelings of hopelessness, guilt, pessimism about the future, decreased energy, difficulty making decisions, irritability. Anxiety can even cause institutions to stop doing things they might otherwise enjoy because they involve taking what feel like risks. Anxious congregations get more and more absorbed with their own worry, seeing and thinking only about the things they fear. The way out of anxiety for an institution can’t be medication. because an institution can’t take a pill. Nor can the way out be some kind of group therapy because most of the people who need help may not be willing to talk. And as much as I’m an advocate for strategic planning and programmatic improvisation, these are still ways of continuing to focus on our internal concerns, even if only to do something about them. Take the whole congregation bowling or miniature golfing. I know of a congregation that goes to Trivia Nights around town together—and usually wins! Walk dogs together. I passed two dog-walkers on the way to my office tonight, and both dogs (though not the walkers) had red-lighted collars on. Festive lights and furry animals walking outside can be transformative spiritual experiences! 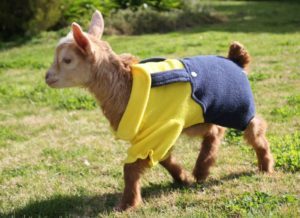 Dress a goat. I received a calendar for Christmas showing sweatered goats in rural Bangladesh. Apparently, goat owners in that region dress their goats in human clothing to keep them warm. The world needs more goats in plaid pajamas—find a way to make it so! Try chair yoga, maybe with a little prayer or Bible study thrown in. Have a music night when everybody shares their favorite song. Play board games. Apparently they’re back in style! I don’t know if this will work. There may be congregations who are past the therapeutic benefits of play. But unchecked anxiety about your congregation’s future will not solve your problem—or anybody else’s. Unleashed fun, on the other hand, could change the world! Sarai Rice consults with congregations on a variety of issues including planning, program development, and governance, and offers coaching for clergy and lay leaders. She has a passion for work across the lines of faith traditions, especially in areas involving community ministry and social justice, as well as a deep commitment to the notion that human institutions should work well for the people they serve.